We are asked here in the UK, via the media, to commemorate the 100th anniversary (4th August 1914) of the beginning of World War One, by putting out our lights from 10 to 11 pm, and lighting candles. We shall set up a torch on our dining room windowsill, which looks out directly onto the street. We shall make a circular walk around the town, which will take in the cathedral and the high street as well as private dwellings. To the left is my grandfather, who fought in the French trenches of World War One. He was twice decorated for bravery, with the Military Medal and the Distinguished Conduct Medal. On one occasion, he went out from his trench into no-man’s-land to drag a wounded officer back to safety. My grandfather was a coal miner all his life. He won a scholarship to grammar school, but his family was so poor that he was unable to take it up; instead, at the age of 11, he had to go down into the mines to earn a living. He returned to ‘the pits’ after the war. The photo to the right is of my grandfather’s younger brother, Edwin. He falsified his age to enlist and followed my grandfather out to France. When my grandfather discovered this, he had him sent home. Edwin secretly enlisted again, again falsifying his age. 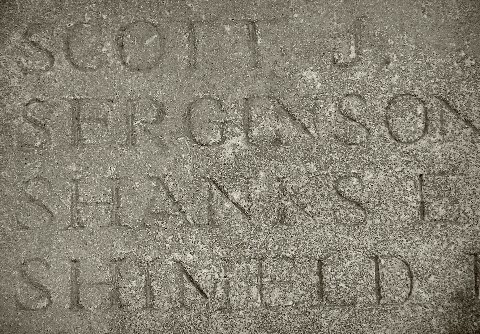 He was killed, his body never discovered, near the Belgian border, just months before the end of the war in 1918. Edwin is commemorated on a stone plaque on a wall in a cemetery for the Canadian war dead, at Vis-en-Artois, near Arras, in Northern France. My grandfather never really recovered from the death of his brother, and from his war experiences. He served as a special constable during World War Two. 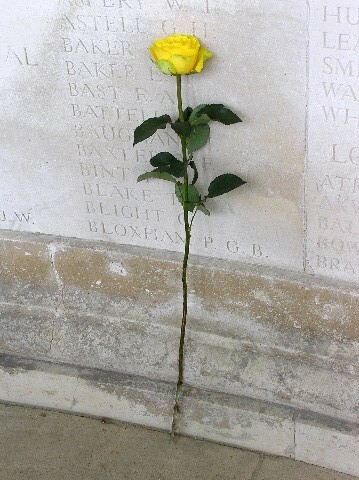 During the time my husband and I lived in France, we visited the cemetery at Vis-en-Artois, where I placed a single yellow rose at the foot of the wall on which Edwin’s name appears. The rose was yellow to represent the yellow rose called Peace that my grandfather cultivated in his garden after the second world war; and during my early lifetime, as I have a strong memory of this rose in his garden; and of knowing its name. 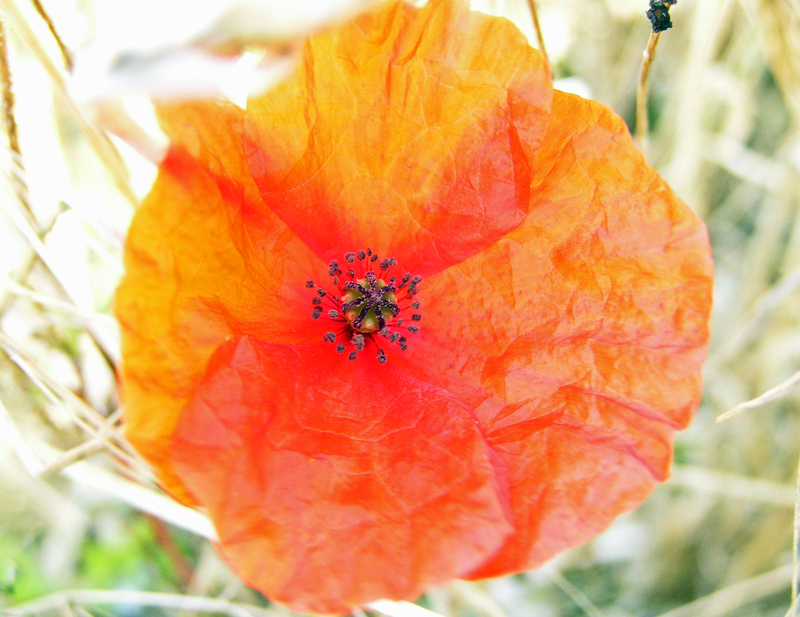 And the poppy is a photo I took of a poppy in a farmed field just off a section of the white cliffs of Dover, during a walk. I was struck by the fragility and transparency of this flower, which has yet endured as one of the strongest of symbols worldwide. How odd that I have recently had a fall from one of these white cliffs, breaking my shoulder. This entry was posted in spirituality and tagged 4 August 1914, Arras, Canadian cemetery, Distinguished Conduct Medal, Edwin Shanks, First World War, French trenches, George William Shanks, Military Medal, poppy, Vis-en-Artois, Yellow Rose of Peace. Bookmark the permalink. Ann, I have Edwin’s WW1 medals. Let me know if you would like to have them? Mark, I sent you a message via Linked In just earlier, the penny having dropped with your name; and then I read about J. I hope to hear from you. Kind regards. My Hungarian grandfather was also a soldier in World War I, as was one of his older brothers. He was wounded and captured and spent two years in a Russian prison, as did his brother. My grandfather somehow managed to escape after two years, and found his way home. His brother did not. After the war was over, he stayed in Russia and married a Russian woman, even though he had a wife and family back in Hungary. As a result, I have cousins in Russia! 🙂 Shared your link on my Facebook. There is probably not many people in the English speaking world who have not had some relative involved in WW1. 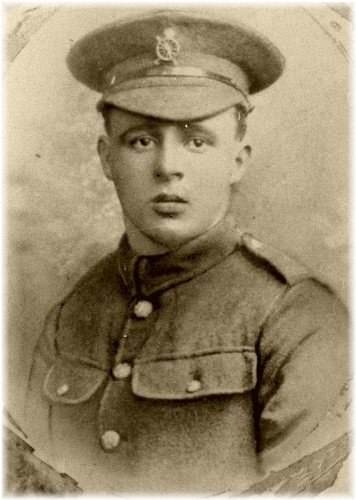 My grandfather, my mum’s dad fought on the western front and was injured several times. He died at age 56 a few years before I was born. 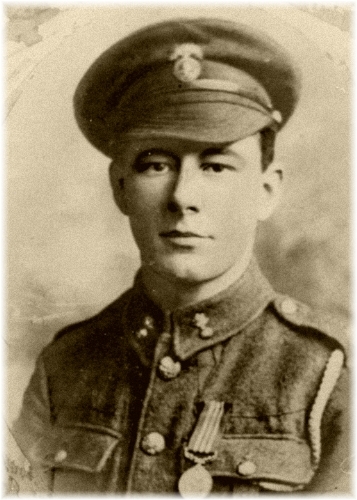 My Aunt’s husband was killed on the western front also, he left behind a small child who as a boy lived in my house. It is a day to remember Ann the lose of innocence by so many and the legacy left to us. Sounds very solemn over your way. Not sure what is happening in this country. But I did smile at the torch image, good thinking, be a bit anti climatic the curtains burning down. Glad to hear you are mending well. And yes we owe so much to those who fought so long ago. Have a good day Ann.